Don’t get me wrong, I love pierogies (or pirohy, whatever floats your boat, but generally in my hometown of Pittsburgh, we go by pierogy). I mean, I. Love. Pierogies. I would marry a pierogi and during the part of the wedding where people throw rice (not that I even have any clue at what part of the wedding that happens or if people even still do that, I think I most be the most wedding-ignorant woman in the world), instead of rice people could throw sauerkraut and chopped onion. They are the biggest pain to make. Worth the trouble? Yes…but…seriously, they are unpleasant to prepare. I really like to cook, and I really like to cook time-consuming dishes, but I think it must be something about the repetitive quality of making dozens of the same thing that just drives me nuts. Also, I hate making and rolling dough (which I make harder on myself because until this time, I’ve always forgotten to buy a rolling pin, and then I have to struggle to roll dough with a bottle of liquor). 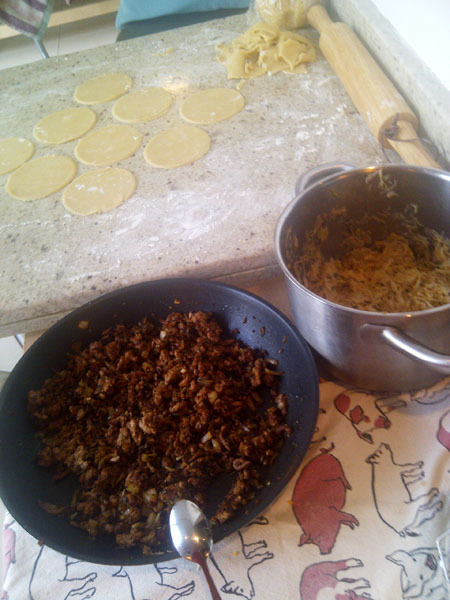 The first time I finished making pierogies from scratch, I recall it took me much longer than I ever assumed (and I even had help) – they weren’t ready to eat until well after midnight and after the ordeal I think I just curled up into the fetal position in a corner of my kitchen and wept. So, I wrote all of the above in advance, expecting a chaotic and messy ‘rogie cooking sesh in my future. And I was wrong. After making 6 dozen of these in one go (3 dozen potato filled, 1.5 dozen veal filled, 1.5 dozen sauerkraut & mushroom filled), I figured I’d be able to share photos of a disastrous cooking area to underline what a pain it is to cook these things, but no. It all ended up surprisingly organized and clean. BUT, that doesn’t mean they were any less of a time-consuming pain! I started cooking these delicious suckers at 11.30AM, and didn’t finish and get to sit down until 7.30PM! Yes, these suckers took me 8 hours all told, with only 2 minimal breaks (one for a quick lunch, another to run out and buy more sour cream). On a side note, I always assumed, probably because pierogies, like the Steelers, are so ingrained in any Pittsburgher’s being, that they were a commonly known and eaten food around the world – or at least the Western world, anyway. But lo and behold, I move to Dubai, and after facing the embarrassment of explaining a Halloween haunted house to Brits (I promise you, there is no way to explain this without sounding like a complete moron), one day I found myself talking about my hunger for pierogies to an audience (of Brits) who again had no clue what I was talking about. I was stunned! Thankfully, at least you don’t sound like a jackass when explaining them.